Hi, I am Melanie, some of you know me as Ladybase. I am looking forward to joining this incredible community in flow at the first annual Flow State Summit July 27-29 at the Lookout Arts Quarry in Bellingham, Wa. Click here to get your prep course and join just at my special ambassador rate. For me, movement has always been an essential part of my life. I spend countless hours on my yoga mat playing and exploring with the circus arts and Acroyoga. No matter what I am practicing in the moment, one thing is abundantly clear, I am always the happiest when I am in my creative mode. My passion has taken me to many international communities, sharing this art wherever I go. I am certified in Vinyasa Yoga, level 1 AcroVinyasa, Yin Training, the Lead with Love Yoga mentorship and I have also taken the Born to Teach Bossy Pedagogy Course. My background in Transpersonal Counselling-Psych lends itself perfectly to the art of movement and the connectivity it brings to ourselves and others. Part of what fascinates me about AcroYoga is the healing that can happen when we train and play together. I believe that Acro is a platform that gives people a wonderful way to practice trust, communication and build community. Nothing makes me happier than sharing how this connection can free us up to create beautiful and intricate movement together. During the Flow State Summit I will give you the skills and confidence to begin or enrich your acro practice. Together we will explore different techniques and principles to build a solid foundation for both the base and the flier. We will lift, spin, hold and move with strength and grace. 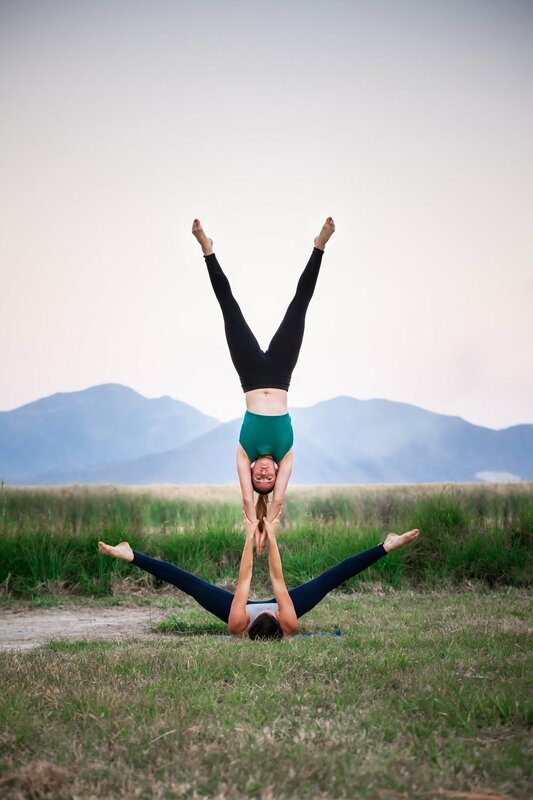 AcroYoga is also known as the yoga of trust, so prepare to develop trust while exploring your playful side at the same time. Learn how to communicate your needs and feel the byproducts of fun and laughter that emerge from this practice. Movement in general has allowed me to be in my Flow, particularly Acroyoga. Nothing like this practice creates a platform to be in the moment, present, and in Acro, with another human. I feel most in my flow when I'm creating, which is what this practiced is all about for me. In a society that sedentary lives, predominantly siting, the practice of movement is critical to our health and longevity. I think that is why the communities of Acroyoga, Parkour, Crossfit etc are flourishing. They get your body and mind to work together, create strength in the body and most importantly, getting people MOVING. Movement can be extremely empowering, challenging your brain and body with new pathways promotes change and growth. When you add another person to your movement, creating the relationship component of partner moves, we create an even greater impact. This summit was born from a place of passion, flow, love and empowerment and I am so excited to be a part of this team. There's something incredibly magical and inspiring when teachers come together to share their passion. Flow State Summit offers this opportunity, and by attending not only will your knowledge base widen, but your heart will grow too. Come fly with us. Embrace your power, find your wings and flow. Join us at the first annual Flow State Summit. We hope to see you there!